Who hasn’t ever started writing his own Framework/CMS? It is considered best practice for learning purposes, but going through all the security stuff can be stressful and boring at the same time. That’s where most devs start to contribute to big Open Source-projects like Typo3 or the Zend Framework, because they are already experienced working with it and yet evolving another system on the market or even getting people to contribute seems like an unachievable task. Instead of wasting his time on yet another ACL implementation, the developer is taking part in making a software become even better, no matter if he delivers new features, reports / fixes bugs or works on documentation (another, yet an often underestimated part of contribution). It is also worth noting that every single Blog-entry and every HowTo thats put on the web also is a great deal of contribution that helps the software spreading. Beginners articles are important to put on the web since every one of us had it’s beginnings and these are the sort of articles where many people decide to either use the software for a certain project or not. As you might see, this article is not only a guide on contributing bugfixes, but also I want to motivate you to just give it a try. 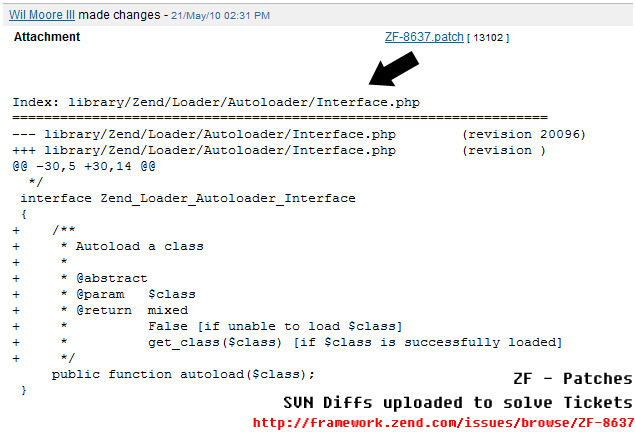 Contributing any code to ZF requires signing the CLA, which is an agreement that both you have the right to share any code you supply, and that you will not patent that code. This is to ensure that the frameworks codebase remains business friendly, and free to use for everyone. In fact you have to actually sign a paper, having done this you can just scan and mail or fax it. This is an important step, and none of your code will be used in any official package unless you did this. The next step will be reading the coding & subversion standards. If you already had a look at actual ZF components code you should be familiar with the standards. Once you took a short insight (you probably wont be able to just remember all of this at once), you can check out the official SVN repository. Notice, that you, even having signed the CLA and being confirmed, do not have commit rights. So you might now ask yourself how to contribute then? All magic is taking place in the bugtracker, ZF’s official Jira. All bug tickets, additions and improvements are filed as tickets here. So if you find a bug, report it here, and soon there will be a discussion in the comments section of a ticket. Mostly all of these people, being listed by their reallife names, are also to be found on different names in the support channel, so feel free to ask them any ticket-related stuff. 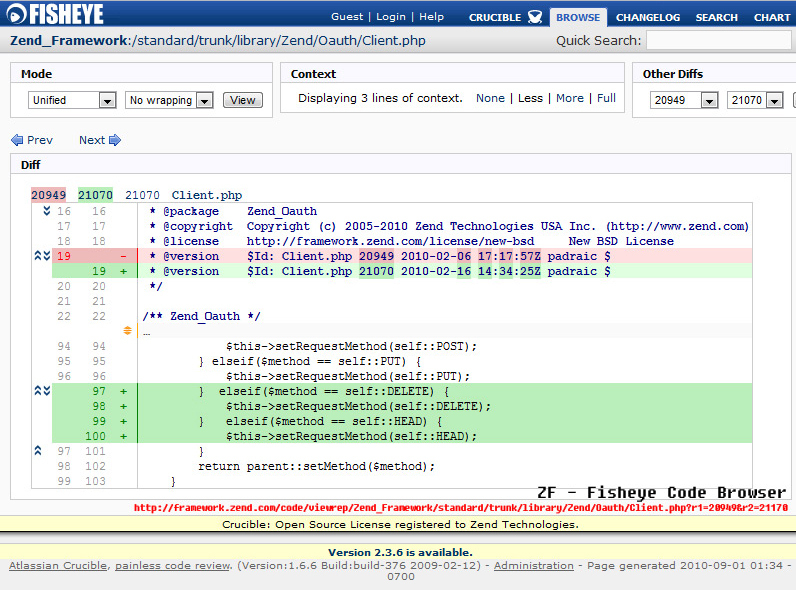 The code itself will be submitted as a patch file (svn diff > patchFile), and uploaded in the Jira-Ticket. This might also be done by people who do have commit rights, but one might not be sure how to fix a problem, or any question might be left. This method of code management then leaves it to the original package developer to decide whether a change should be made or it should be thought over again (might have side effects on other packages and so on). The last yet very important point is unit tests. ZF makes heavy use of them and so should you. The best you can do is report bugs as failing tests with a short description, fix them with the code diff and then deliver them with working tests. As you might now see, once the problems and the contaminated areas are visible, you can pull out your armory and kill the bugs within minutes. The contribution of new packages for the ZF are made in the Wiki, filed as proposals that later get discussed by the community review team, but I might do another article about that one as its a not so trivial workflow. Whenever you fix a bug or deliver an improvement you will be listed on the official Jiras Overview page of top contributors. Can you make it to the top? ZFs bug hunting days are the place for many contributors to join the battle on a shirt, but you might also see that being an active contributor on an open source project might be a good point of interest on your CV. Having run out of things to say, I want to call all the devs out there to give it a try. A short quote of Ben Scholzen (ZF Core developer): “I code whenever I feel like it”: In closing, remember that neither having an account on JIRA nor Signing the CLA ties you in to any minimum commitment, and you can do as much or as little as you are comfortable with. Just pick the level which feels right for you. 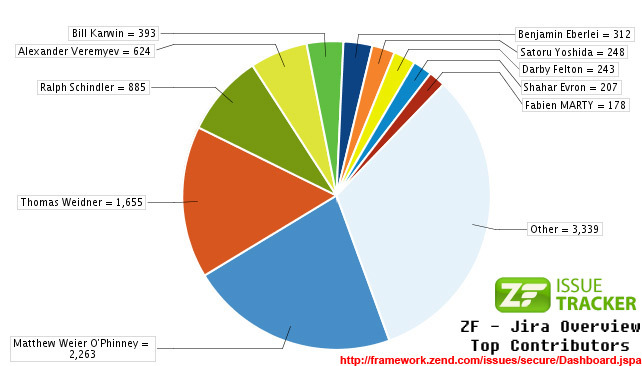 5 Comments for "Contributing to ZendFramework"